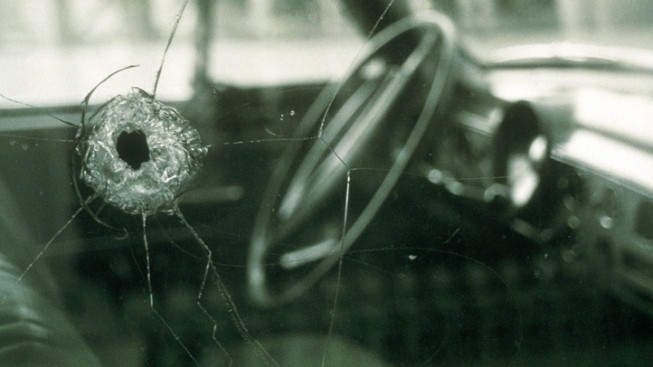 A bullet hole in the window of a vehicle. Police are searching for a driver who shot at a vehicle during a road rage incident in South Burlington. Authorities say the motorist confronted another driver who'd allegedly driven through a red light and come close to causing an accident Sunday night. Police say the suspect reached into the stopped vehicle and hit the other driver in the face, and then shot at the vehicle as the 65-year-old man from Minnesota was trying to drive away. Police say the victim was struck by glass shards. He was treated at a hospital and released. The suspect is described as a white man with a slender build who was driving a newer model sedan.